Online ordering menu for Coyote Flaco (Poughkeepsie). Welcome to Coyote Flaco Poughkeepsie, offering authentic Mexican cuisine made with the absolute freshest ingredients. Regardless if you're going for classics like our Enchiladas Rojas and Chimichangas, or Coyote Flaco specialties like the Quesadilla Linda--made with cheese, mushrooms, baby cactus, and pico de gallo--our menu is sure to please any taste bud. Make sure to check out our specialty wraps menu too, including the Garden, Coyote and California--made with rice, beans, guacamole, and veggies. Coyote Flaco Poughkeepsie is located just north of the Salt Point Turnpike and North Grand intersection, just half-a-mile south of Dutchess Raquet & Pool. 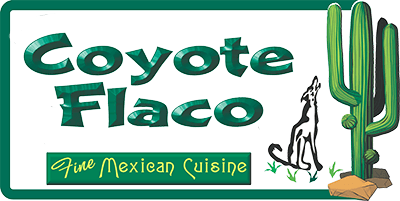 Order Coyote Flaco Online Today for Carryout.